The Interferometric Synthetic Aperture Radar (IFSAR) program represents an effort to ingest and process high-resolution elevation data produced through a technique called radar interferometry. The main source of these data will be the Shuttle Radar Topography Mission (SRTM), which is an IFSAR mission to be flown aboard the Space Shuttle in January 2000. The Shuttle Radar Topography Mission is a joint project of the National Imagery and Mapping Agency (NIMA) and the National Aeronautics and Space Administration (NASA) to map the world in three dimensions. The IFSAR program within NIMA is investigating characteristics of IFSAR elevation data along with methodologies for on-site validation and processing of raw terrain elevation data. This effort should result in a NIMA production capability to process IFSAR and develop data sets that satisfy improved user requirements and provide worldwide DTED [Digital Terrain Elevation Data] coverage. The 11-day SRTM flight will yield enough data for a digital model of Earth that is more detailed than what is currently available. Successful completion of the SRTM data set will provide NIMA with coverage of most of Earth's populated land areas, with three times better resolution than previously available. A key SRTM technology is radar interferometry, which compares two radar images taken at slightly different locations to obtain elevation or surface-change information. Unlike earlier missions, SRTM will use single-pass interferometry, which means that the two images will be acquired at the same time -- one from the radar antennas in the shuttle's payload bay, the other from the radar antennas at the end of a 60-meter (200-foot) mast extending from the shuttle. Combining the two images produces a single 3-D image. A key advantage to radar is that it can "see" the surface through clouds and in darkness. 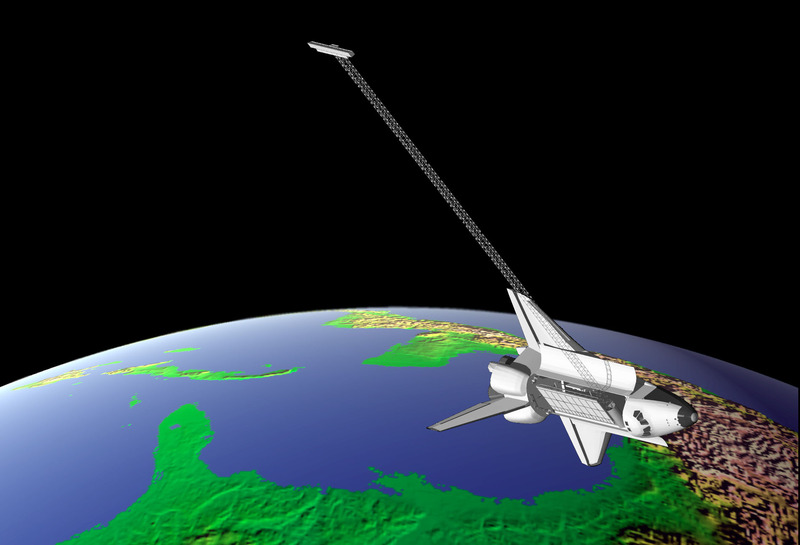 A 60-meter-long, deployable mast derived from space station designs. Additional C-band and X-band antennas located at the end of the mast. Avionics for attitude and orbit determination. SRTM will acquire data with 225-kilometer swaths during the 11-day shuttle flight, imaging all of Earth's land surface between 60 degrees north and 56 degrees south latitude. The SRTM will image 80% of the Earth's land surface and will produce approximately 14,300 Cells (1 degree by 1 degree) of terrain height data. This data will provide NIMA with the means to meet the standing requirement to provide Level 2 DTED specifications (30 meter x 30 meter spatial sampling with 16 meter absolute vertical height accuracy, 10 meter relative vertical height accuracy and 20 meter absolute horizontal circular accuracy). The data will then be processed into a digital topographic map. Data processing will require one year. The resulting digital topographic map will form a homogeneous data set referenced to a uniform global geodetic datum. Data formats will be compatible with standard software and terrain analysis programs, tailored to the needs of the civil, military, and scientific user communities. Just about any project that requires accurate knowledge of the shape and height of the land can benefit from this data. Scientific applications include geology, geophysics, earthquake research, volcano monitoring, hydrologic modelling, and co-registration of remotely-acquired image data. Civilian applications include enhanced Ground Proximity Warning Systems for aircraft, civil engineering, land use planning, and line of sight determination for communications (e.g. cell phones). Military applications include flight simulators, logistical planning, trafficability analysis, missile and weapons guidance systems, and battlefield management. The common backdrop supporting Department of Defense (DoD) navigation and/or weapon systems and their development is spatially referenced data. The newest navigation and weapon systems require digital geospatial information in increasing amounts, more quickly, and on varying media, for successful mission operations. The Global Positioning System (GPS) is being integrated into all DoD combat forces, at all levels, from the hand-held receiver carried by the infantryman to the embedded GPS navigation aids on the most modern aircraft to provide precision location determination and navigation support. GPS is a part of the guidance system in most current and planned precision-guided munitions being acquired by the Services. Precise navigation using GPS is required for vehicles, anywhere on the surface of the Earth, under the sea, and in and above the atmosphere. An inherent difficulty in any precision navigation system is the accuracy of maps on which it is based. Precision navigation requires more accurate elevation data than what is currently available from existing maps. Warfighters use height information in several varieties: barometric altitude (referenced to atmospheric pressure); mean sea level [MSL] elevation, above ground level [AGL] elevation, radar altitude, contour values and spot elevations (all related to the mapped surface); geoid height (related to the bumpy, undulating physical model of the world's gravity); and the ellipsoid height (based on the smooth geometric model of earth). Typically, GPS receivers display elevation data referenced to the ellipsoid, not the geoid. GPS allows knowledge of actual position to a higher accuracy than the accuracy associated with the scale of the chart and often to a higher accuracy than the surveys from which the chart was made. Spherical Error Probable (SEP) is the radius of a sphere within which there is a 50 percent probability of locating a point or being located. This three-dimensional accuracy is commonly referred to as "bomb on target" since it provides an altitude enhancement over the two-dimensional Circular Error Probable (CEP). The military GPS Precise Positioning Service (PPS) accuracy level is specified to be 16 meters spherical error probable (SEP). GPS position errors are always about twice as bad in height as along either horizontal axis. This means a horizontal error of about 10 meters. Accuracy improvements are expected to be approximately 7 meters spherical error probable (SEP) in the full GPS Block IIR constellation. DoD has been confronted with the need to balance a wide range of different and sometimes competing national security, civil, foreign policy, commercial, and scientific interests. The challenge has been to exploit the full civil utility of the system without jeopardizing national security interests in the process. The civilian GPS level is set by DoD policy, and is guaranteed to have a horizontal error of 100 m or less 95 % of the time. SHUTTLE LANDING Voice of America 22 February 2000 -- The space shuttle Endeavour landed at Kennedy Space Center Florida Tuesday evening. The touch down completed an eleven-day mission that resulted in the most detailed maps ever produced of the Earth's surface. SHUTTLE Voice of America 21 February 2000 -- Thanks to a nine-hour extension that allowed mapping to continue into Monday, the instruments covered virtually 100-percent of the land area scientists had targeted. SHUTTLE Voice of America 21 February 2000 -- The 60-meter-long radar mast that was key to the mission's success had trouble retracting. SHUTTLE Voice of America 18 February 2000 -- The radar mapping mission of the U-S space shuttle Endeavour may be extended because of extraordinary fuel conservation measures by the astronauts and flight control team. Chinese Scientists Participate in SRTM People's Daily February 18, 2000 -- Among the 42 chief scientists who participate in the Shuttle Radar Topography Mission (SRTM), only one, Guo Huadong, director of the Remote Sensing Application Research Institute under the Chinese Academy of Sciences and expert in radar remote sensing, is from China. 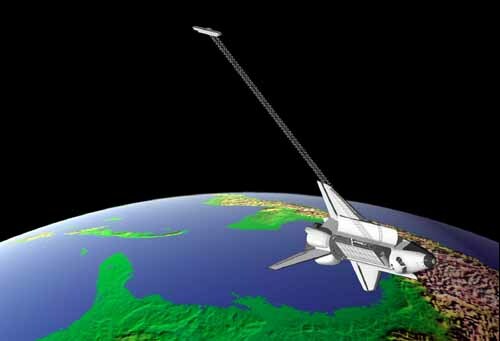 SHUTTLE Voice of America 17 February 2000 -- A series of small fuel saving steps devised by ground controllers has given Endeavour enough reserve to finish mapping Earth's terrain by radar. SHUTTLE WEDNESDAY Voice of America 16 February 2000 -- U-S space shuttle controllers say they have saved almost enough fuel aboard the orbiter Endeavour to allow the radar mapping mission to continue as planned. SHUTTLE MAST Voice of America 14 February 2000 -- A small valve at the end of the 60-meter mast emits nitrogen to hold the boom steady. But despite a constant nitrogen flow, the valve is not providing enough steadying pressure. SHUTTLE LAUNCH Voice of America 11 February 2000 -- The first U-S space shuttle mission of the year has finally gotten underway after months of delays because of technical problems and weather. SPACE SHUTTLE ENDEAVOUR TAKES OFF ON MAPPING MISSION ABC NEWS 11 February 2000 -- Mr. JOHN PIKE (Federation of American Scientists): With all of our airplanes and helicopters navigating using satellite navigation, they need to know where the valleys are they can hide in, and they need to know the hills that they need to avoid. Mapping the Earth, Swath by Swath By WARREN E. LEARY The New York Times January 25, 2000 -- John E. Pike, a space and military policy expert with the Federation of American Scientists, said the military agency had legitimate concerns about releasing the detailed data. "This information is potentially useful to other militaries, also," he said, "The Defense Department wants to see that the data doesn't fall into hostile hands." Radar Mapping Mission Makes Strange Bedfellows of JPL, Defense Department By Paul Hoversten Space.Com 24 January 2000 -- "This is basically a one-time deal," said John Pike, space policy director at the Federation of American Scientists in Washington. "I think DOD is quite happy launching its own satellites on the un-reliable Titans which have a bad habit of blowing up. In this case, they saw a good thing and decided to take advantage of it."